I've posted recipes for this bread--or variations of it--in the past on numerous occasions, but the two most popular are here and here. Those two posts, in fact, draw the largest amount of visitors to this blog everyday (through search engines, I imagine). Yup, I can carry things on my bike until I'm blue in the face, and talk about quotes and all things spiritual...but the topic that gets the most hits are my recipes for Ezekiel Bread. This post is a little different in that I made the bread at home (opposed to at work in a commercial kitchen), and I did not use any refined (white) flour; just whole wheat. And for that reason the recipe is slightly different than the others (a printable recipe follows the pictures). This one, I believe, is more true...refined flour was unknown in biblical times. But I'm getting ahead of myself. In this post I also wanted to offer some of my personal views on Ezekiel bread and its recipes in general (I know what you're thinking...here he goes again, up on his little soapbox...but hey, isn't that why people write blogs in the first place). Many people know--but some may do not--that the original recipe, vague as it is, comes directly from the Bible, in the Book of Ezekiel. That's it; that's all it says. But I'm getting ahead again. Before I offer further views I first have to say that I read this recipe the same way I read the Bible; I read the Bible with a metaphysical view and am intrigued by it's mystery (and even sometimes overwhelmed), but view it mostly as metaphor. In short, I am not a literalist and truly believe that most if not all of the Bible is open to interpretation (and yes, I realize that some may say that I'm going to hell for this proclamation, so here's another one...I don't believe that hell exists). Now I'm really getting off point. This said, I can see how someone could interpret the above sentence to say to sprout the grains before making bread with them...but then again, it doesn't actually say that. There is no mention of adding water to the jar to sprout the grains or even how to make a sort of dough...but just to use them to make bread for yourself (and I have neither the time nor desire to expound on all the metaphors of bread in the Bible). But if a person were to add water the grain would eventually begin to ferment (and leaven) given the amount of time Ezekiel is told to lie on his side in the desert. And as far as using flour in this recipe...umm, I may be wrong but I'm pretty sure that flour is made from wheat, spelt, and barley; three of the main ingredients. Nobody that I know of would want to take this recipe to the literal extent. After giving Ezekiel the recipe, instructing how much of it he should eat each day, and how long he is to lie on each side in the desert, God tells Ezekiel to cook the bread over human excrement, to which Ezekiel pleads that he be allowed to use animal dung instead of human waste. Thankfully God agrees. I'm still trying to figure out the metaphorical or mystical reason behind this; surely it is not literal. The Book of Ezekiel is, of course, a record of a series of visions recorded by the Prophet Ezekiel. Thus in my view there is no way to tell what the actual recipe was or is. As aforementioned, like most (or all) of the Bible, I believe that this recipe (sentence) is open to interpretation. The recipe that follows is my personal interpretation. What's slightly different in this recipe (opposed to previous versions where I used some white flour) is that rather than using a loose pre-ferment (French poolish), I used a firmer one, more like an Italian biga. And I also incorporated the autolyse method with the remaining flour (meaning I soaked the whole wheat flour to soften it). Anyhow, here it is in words and pictures; a printable recipe follows. It's a simple recipe...basically, put some beans and grains in a pot and make bread for yourself. Start by boiling the grains in logical succession to insure that they are thoroughly cooked without completely dissolving. If too much water evaporates add more to the pot (you'll need some of the cooking liquid for the bread recipe. by using the cooking liquid you are utilizing nutrients that may have been leached out of the grains during their cooking). After all of the grains are soft, strain them--reserving the liquid--and allow them to cool off (refrigerate them if necessary). Beautiful, aren't they? 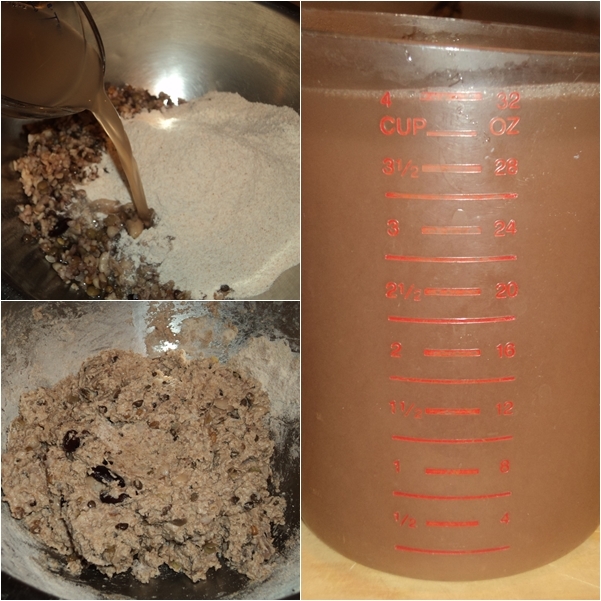 Make the pre-ferment with the cooked grains, whole wheat flour, and a portion of the cooking liquid. Allow the pre-ferment to rest for at least an hour or two ( I let it ferment overnight). Then, in a second bowl, combine the whole wheat flour with some of the remaining cooking liquid (do not add yeast or anything else to this at this point...this is the autolyse method I referred to earlier). The flour-liquid mixture only needs to rest for an hour or so. Next, combine the pre-ferment with the flour-liquid mixture, along with a bit of honey, olive oil, salt, and an additional pinch of yeast. Knead the dough until it passes the windowpane test. 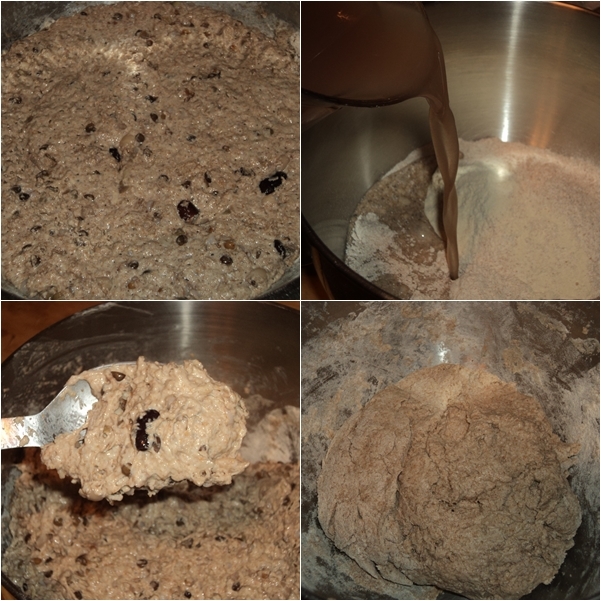 Place the dough in a bowl or rising bucket and allow it to rise once or twice. I slowed its fermentation by placing it in the refrigerator for six hours, but you can still see it's rise...it almost popped the lid on the bucket. 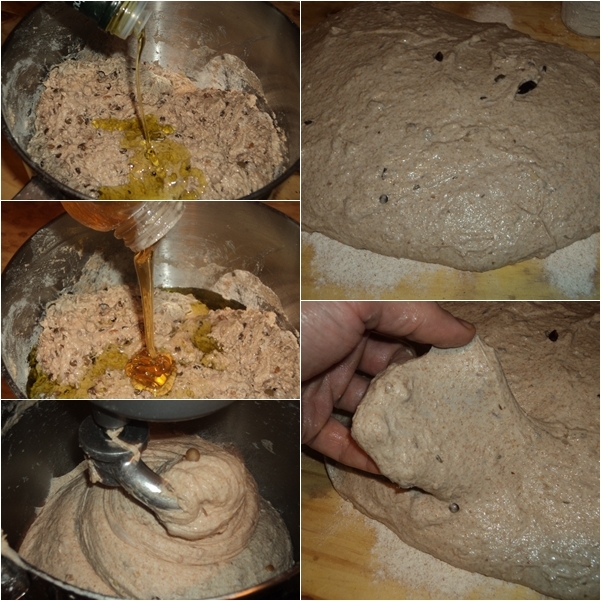 Portion and shape the dough. Place it into pans and allow it to rise. Bake the loaves for 30-40 minutes and then let them cool before slicing. You can see the nice open crumb and specks of grain. It is not necessary to grind the grain because most of it sort of mashes into the dough as it's kneaded. It is as delicious as it looks. This bread makes excellent sandwiches and toast. Some say that it is nutritionally complete. This post and the pictures may make it seem like this is a difficult or overly complicated bread to prepare...it's not. It is as simple as any other bread with just a couple extra steps (mainly cooking the beans and grains). If you look at the recipe and break it down into steps or stages you will see that it is rather simple. I encourage you to try it...you will be glad that you did. Place two bowls side-by-side; one will hold the pre-ferment, the other autolyse. In one bowl combine the cooked and drained grains with 1 cup of the cooking liquid, 2 cups whole wheat flour, and 2 teaspoons instant yeast. Stir it just until combined then cover it with plastic wrap. In the other bowl combine 4 cups whole wheat flour and 2 cups cooking liquid; stir it just until combined then cover it with plastic wrap (take care not to get yeast into this bowl). 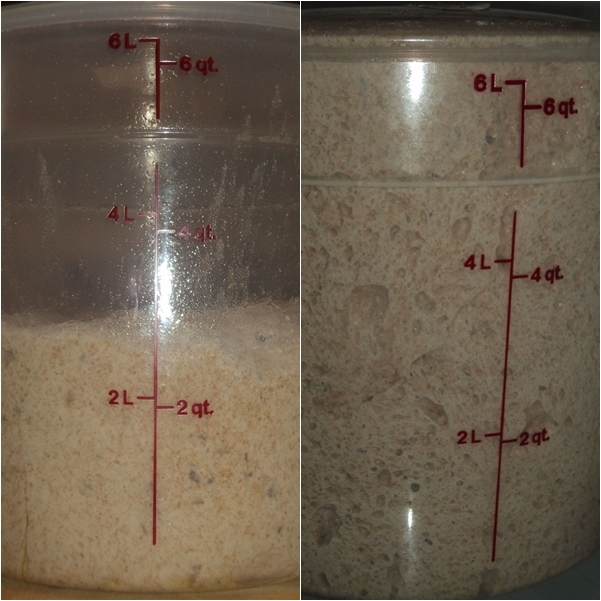 Allow the bowls to rest at room temperature for about an hour, during which time the preferment will begin it's job multiplying yeast and fermenting flour, and the autolyse will soak liquid, swelling the gluten. You have to know that I am going to give this recipe a serious try in a month or two after getting myself familiar with some of the bread making fundamentals. Your explanation of the procedures are thorough while being non intimidating. Gorgeous loaves and process. I have oft wondered how the sprouting became a part of the interpretation. Who knows? Awesome job, I may try sometime this week. This is my all time favorite bread...let me know if either of you try the recipe. This does sound like good bread, and your instructions are great. I'll try it as soon as I can find all the grains. One thought about the dung issue - in areas where wood is not available, dried cattle dung is the preferred fuel. I suppose if humans ate as much straw and grass as a cow, dried human dung would work just as well for making a fire - and back then, when there wasn't any processed foods available, maybe it really would have worked. Ezekiel's objection may have been based less on his squeamishness than on the difficulty of finding enough dried human dung to make a fire that would last long enough to bake his bread. - just conjecture, of course. It's an interesting story. My dough turned out too wet and so had to add extra flour to be able to knead it. I followed all measurements accurately. Maybe there was too much liquid in the grains still after straining them as I did not actually squeeze the liquid out of them. What do you think? What could I have done wrong as the dough was cakey when mixing with the dough hook? Rose, Yes it was simply too wet, probably from not squeezing the grain enough. It's a simple fix to add more flour though, and it's better if the dough is too wet than too dry (it comes out lighter if it is wet). But if it was like cake batter it was probably too wet. Also, keep in mind that measuring flour by the cup--opposed to the European way of using a scale--is not as accurate, thus my cup measurement and your cup measurement are likely different. But this is where practice comes in. Do it a few more times and you'll know what works and what doesn't. Something similar happened to me today actually (a dough that was too wet); I was making a rice bread. I added more flour and it came out fine. If I get time I'll post about it in the next couple of days. Thanks for reading and commenting...let me know how the next batch comes out. Well, I tried this today, but met with limited success. The first bowl with the grains, flour and yeast looked right. The second seemed strange. That amount of liquid nowhere near got the flour all moist. In fact I had to leave some flour dry on the sides as it would not mix in. When I did put all of it together, it rose well enough to twice its amount, but was terribly wet. After turning it out, I kept adding and adding flour, but it refused to become like a bread dough. Finally I just dumped it into pans and baked it. It did not rise in the oven very much. So I ended up with bread that tastes pretty good, really, but is dense and heavy. I'll try again. Any tips on why the mix would never get any less like a thick cake batter? ljcurletta, Thanks for your comments. You are the second person who mentioned their dough was too wet. For my explanation of this please read my reply to Rose which is above your post (probably the grains need to be squeezed out more). Also, because you are the second person who said mentioned this, I plan on making the recipe tomorrow following my own directions exactly. To see the results look at the main page of this blog. Thanks for reading the blog and trying the recipes. Well I used your recipe and it was the first time I had ever baked anything. I'm not a cook either by the way lol, but it turned out wonderful!!! I should have put more dough into the bread pans because they turned out more like a think browny then a loaf of bread but it taste and looks perfect. Brad, Thanks for trying the recipe and letting me know how it turned out. It will get better (and easier) the more times you make it. If the dough is too loose add a bit more flour, and it does sound like you either need to add more dough to the pan or use smaller pans. Peace. 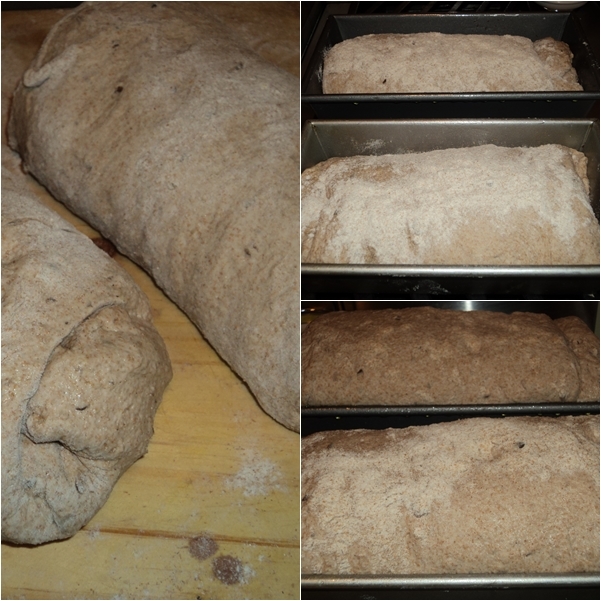 I make Ezekiel Bread following your previous (poolish) recipe regularly. Is is a nutritionally complete food, meaning it contains all the necessary amino acids. I love it and thank you for it. God told Ezekiel to eat twenty shekels a day (about 10 ounces) by weight, and to drink the sixth part of a hin (about 21 ounces) of water per day. Instead of a normal fast (water with no food), I frequently eat ten ounces of Ezekiel bread per day for three days. Substituting green tea for coffee enhances the flavor of the bread and adds to the benefits of the fast. Everything Ezekiel did was symbolic and related to his prophecy of the Babylonian siege of Jerusalem. During a siege wood for cooking could not be gathered outside the city walls. As a siege wears on the animals will have been eaten, so dung will not be available. God's instructions to make bread of seeds and beans, cook it over human dung, and drink little water are prophecies of the dire conditions the residents of Jerusalem will encounter. More will die by starvation and disease during the siege than by the ultimate destruction of the city. Thanks again for posting the recipe. By the way, I admire people who get about cities on bicycles. Your blog is incredible, quite priceless. What temp is best to cook the bread (couldn't find it in any of the E. B. recipes)? Wow, this is the first homemade bread I have ever attempted. I followed the recipe - only I used a pressure cooker on the beans, etc., and I hand kneaded the dough. Man, it turned out so good. Amazing with honey or apple butter. And my wife is impressed. Thanks so much for sharing this. Bll, Thanks...I'm glad the bread came out great. Always like to hear of people baking their own bread. Thanks for visiting and commenting. Thank you so much, I have been a little nervous to try Ezekiel bread even though I am an avid bread maker. I used fresh ground flour from hard red wheat and had to sub some of the grains as I did not have them all on hand...I used quinoa, lentils, beans, and spelt. It still turned out fantastic! Thank you so much...trying your sweet potato sandwhich bread next. Also to DDDuncan, I really appreciated your knowledge of the Old Testament and courage to share. Thank you so much for your kind words. I'm glad the recipe turned out well...it is by far my favorite recipe. Interestingly, I was just about to post the recipe again (because I haven't in a while but was wondering if I should) when I received your comments. Peace. Joan...thanks for letting me know how the bread turned out...and that it came out great. Ezekiel is by far my favorite bread. Thanks for visiting and commenting. There was someone who used a pressure cooker to cook the beans and lentles, how long did you cook them and was it high or low temp? Hi Joe! Thank you for sharing your recipe, I just pinned it and can't wait to try it! I love your pictures and your instructions. I was wondering if you have tried freezing it and what would be the best way to do it? Ok perfect, thank you Joe! "Gorgeous loaves and process. I have oft wondered how the sprouting became a part of the interpretation. Who knows?" Ezekiel had to sprout them, he was on his side and couldn't get to a mill! Made this last week with small modifications. 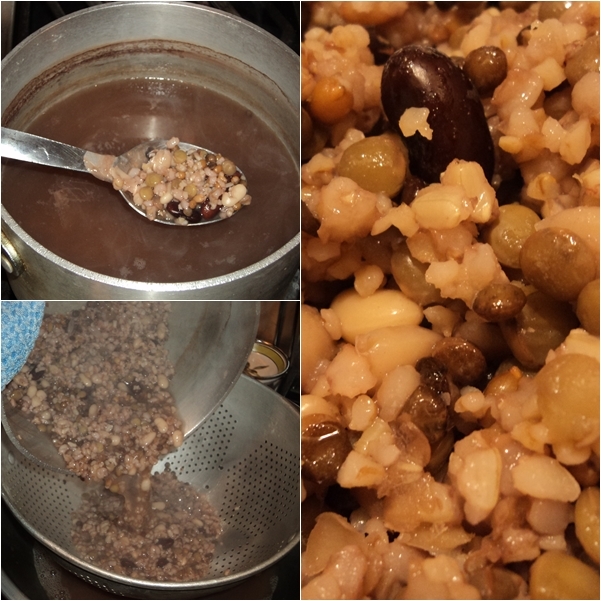 Since I was just testing it, I only bought lentils, barley and bulgur wheat and increased the proportions of them to accommodate the missing beans, spelt and millet. Turned out very well. I did have to add more whole wheat flour than specified to make it less wet and more kneadable - and the baking time was closer to 50-60 minutes - but I'm pleased with the result. Very tasty and one slice satisfies my hunger! Will spring for the beans, spelt and millet next time I bake this. Joe, I also need clarification on cooking the grains and legumes. 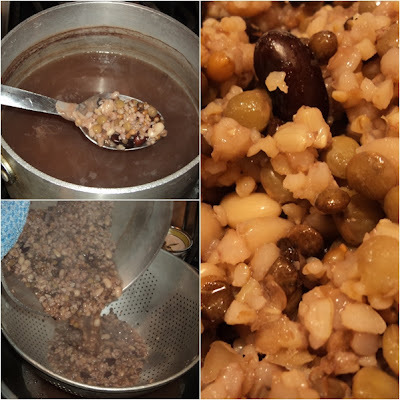 Your write: "Boil the grains in the water in logical succession according to cooking times: first the white and red beans (about 60 minutes), when they are soft add the, spelt berries, lentils, and barley (about 30 minutes); lastly, add the millet and bulgar (about 10 minutes)." Does that mean I add the spelt, lentils and barley after the bean have cooked for 30 minutes or 60? And do I add the millet and bulgur after another 20 minutes or 30? That is, are the times you've given total cooking times for each ingredient or times for each step? Paul...a couple things. Firstly, thanks for visiting, commenting, but mostly for trying the recipe (and I'm glad it came out well). 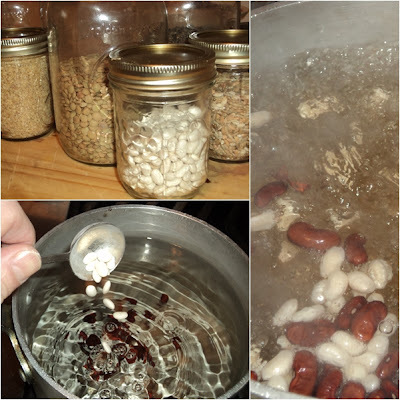 Yes, boil the beans and grains for the full amounts listed. You may have to replenish some of the water. It is imperative that everything is fully cooked or it would really ruin the bread (undercooked beans would make it inedible). I suppose if you soaked them first it would shorten the cooking time, but that would be an extra step. Also, the dough was likely wet for a couple reasons. One is that lentils are softer and retain more moisture. Replacing the beans with lentils is fine but you'd need to adjust the moisture in the dough. And also, in the original recipe (this recipe) there was too much moisture if the beans and grains were not squeezed enough. If you haven't already, please take a look at the below link for another post regarding this same recipe. Thanks again and happy baking. Just made my bread and it is wonderful! This is one of my favorite now too! Thank you for sharing. Only one thing - I set the oven to 375F because I didn't see a temp listed. THANK YOU SO MUCH! Thank you...even now, your recipe's. the best! 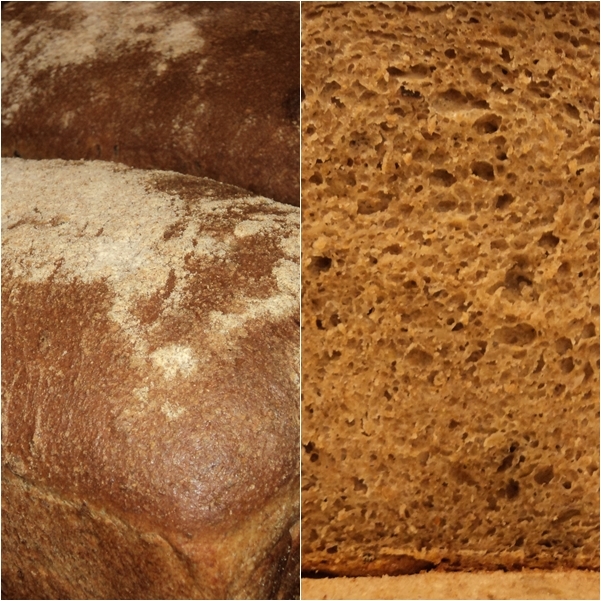 I chose your blog when googling Ezekiel bread as I did not like the recipes on other sites. I have never joined a blog before, but I am certainly impressed with yours. Easy to move from subject to subject, post to post. I will bake the bread and report back. New Zealand flour is different from American, but we will see. I have baked Nancy Silverton breads from sourdough starter for years but now need a different sort of bread. Thanks for the clear and attractive photos. You are right, the grains are beautiful. Judy, Thanks so much. I'll be interested to hear how your bread comes out. Also, what is different in the flour in NZ? Is it the gluten content? Thanks again. I am wondering if soaking would be good enough, instead of cooking it - for nutritional purposes. I'm guessing I'd have to soak for much longer since I would not be boiling the ingredients. Any thoughts? Do you think I could throw all the beans and grains together to cook in the crock pot? I have bee baking Ezekiel Bread for several years, but tended to buy the various flours already ground than grind my own(except for the beans.) It sold well, but the purists kept ragging on me about not only not grinding my own stuff, but for not sprouting them as well. Your blog helped reinforce much of what I had felt, so I took courage and tried your method to compare the crust, crumb, and texture. I truly love your recipe, but it needs to be stressed to get all of the water out of the mash, or the final dough will be too moist, and the wheat flour won't be moist enough. Your recipe is much lighter than what I was making, and the flavor is excellent. Toasts beautifully. I do think a novice would have some difficulties with some of the procedures, but, hey, we all learn from our mistakes! I'm looking to try this recipe and...have never baked bread before...have you ever tried doing this in a slow cooker? Your thoughts?